The Nashville Predators are ending one of the most successful months in franchise history and ready to move into April, which will feature fewer games and a chance to exorcise an old demon by making it to the second round of the playoffs. March was a great month. After Tuesday's 2-0 loss to the Kings, Barry Trotz said, "We've played seventeen games, the most of any team in the league this month. We're 11-5-1 now and if you had told me that in February, I'd say let's go to April now." Every year, before the season starts, teams wonders how the squad will come together and what it will look like once they actually hit the ice. What we saw in March, as a whole, should be pleasing to Predator staff and fans alike. After five months of ups and downs, the true character of this year's team finally came together. The return of Pekka Rinne's dominance in goal, with him winning three star honors two weeks in a row. The emergence of Colin Wilson as a dependable every day player that appears ready to stay in the NHL. Positive additions to the team in Dustin Boyd and Denis Grebeshkov, even though the latter has been sidelined with a freak injury. Patric Hornqvist becoming the fourth Predator to hit the thirty goal mark. David Poile's gamble to keep Dan Ellis and Dan Hamhuis paying dividends. Playing seventeen games in a month and going 11-5-1. Off the ice, attendance goals were met. The return of Jason Arnott's reoccurring head injury and injuries to Marty Erat, Joel Ward, Denis Grebeshkov, and others. A downturn in the Predator's ability to score, especially as the month wound down. Inconsistent play on special teams with a ying-yang thing going on between the power play and the penalty kill with each having good runs and dry spells at opposite times. A trend of third period defensive lapses including giving up two goals in three of the last four games and a complete melt down in San Jose where the Preds gave up six goals. A few games where the team failed to show up including games in Detroit and at a Sunday home game with the Canucks. Bad quality of ice at the Bridgestone Arena as the weather has warmed. All in all, March was one of the most successful months in Predator's franchise history and proved to the team and fans that when they play "Predator hockey" that they can compete with any team in the league. The Predators will return to the ice on Thursday night against the St. Louis Blues to celebrate April Fools Day. Hopefully, the joke will be on the Blues and not the hometown Preds. Here is our game recap from yesterday with post game interviews. The Tennessean has the game story, notes column, and John Glennon's post-game ponderings. Jim Diamond has his the AP story at Preds.com. David Boclair at The City Paper has their game story. From the Predator bloggers comes stories from Brandon Felder, See Puck City, Forechecker, Mark Willoughby, and Fan Huddle. The other side of the King's story comes from the L A Times, Kingscast, FS West, Press Telegram, and the Kings Insider with Rich Hammond. Ryan at the RLD has an addition to the "History will be Made" series, with Radulov slamming Arnott in the playoffs. Jim Diamond has an update from Saturday's Pet Adoption Drive. It was interesting watching the people and the dogs before the game. Join Paul McCann and special Gust Host Dirk Hoag on HockeyBuzz Radio from Dave and Busters with guests Craig Custance of the Sporting News, St. Louis Blues analyst and former NHL goaltender Darren Pang, and Milwaukee Admirals radio play-by-play man Aaron Sims. It's also on WNSR at 6:00. Ex-Pred Vern Fiddler's wife could have a baby at any time. Pekka has a new mask. Unknown when he will wear it. Those following the activities of potential Pred owner W. Brett Wilson may find this interesting. Despite denials from all sides on Monday, the Globe and Mail is still pushing the Phoenix to Winnipeg story. The hottest thing going on YouTube is parody vids of the NHL Cup commercials. This one that Steve Lapore found takes the cake. "What if Gordon Bombay didn't blow a .o8". Matt Reitz looks at what having a new baby in the house does to a hockey player. Brian Metzer has the story of the new Kris Letang contract. Our friend, The Rick, assaults Joe Beninati for his horrible game call of the Bruins-Sabers game on Versus. Puck Daddy has the real demise of the legendary Johnstown Cheifs (no, this is not a movie). Hockey Fantasy Expert Rob Higgins' band, Dearly Beloved, has a new album out as of yesterday. New on @intenttoblow: Study confirms you do not miss every shot you never take. I've linked this Blackberry App several times and will continue to do so as it is the best one for hockey scores out there. It doesn't work on every model but offers scores with less than 30 seconds delay, shots, Corsi, face off, hits, and goal scorers. Facebook will make a change from "become a fan" to "like" according to this piece. Our "Fan" page is under development at this time. We are adding thousands of original pictures that will only be available there once the roll out is complete. For a sample, go here and look at the pictures under the photo tab. We should have pictures of all 30 teams by this summer. LinkedIn now has a Blackberry App. The Los Angeles Kings came into Music City on a four game losing streak and had also lost seven in a row to the Nashville Predators. Both streaks were snapped in a 2-0 victory over the Preds when rookie Jonathan Bernier stopped all 34 shots that Nashville sent his way. Scott Parse scored the game winner at 7:50 in the third period on a play where there was a lot of traffic in front of Preds goaltender Pekka Rinne and he was able to slip it into the net. The Kings got an insurance goal from Sean O'Donnell with 2:01 left in the game. Both teams were down a man due to a double cross checking penalty that had sent Steve Sullivan and Drew Doughty to the bench at 16:45. The Kings held on through the last two minutes of the game as the Preds were unable to mount a charge during the goalie pull. Bernier was near perfect on the evening and never seemed to lose composure when pressured by the Predator attack. Pekka Rinne actually played a great game making several highlight reel saves before giving up the two late goals. For the game Rinne stopped 29 of 31 King's shots. The Predators remained in fifth place in the Western Conference by the slimmest of margins. With Detroit and Los Angeles winning, the Preds are only a point ahead of the Wings and two points ahead of the Kings. Both teams have two extra games to play and accumulate additional points. Jonathan Bernier played with the composure far beyond what you would expect from a 21 year old who had only played five prior NHL games. He was elated after the game saying, "It's great! The guys had a really good game. They played the way they are capable of playing. We blocked shots at the right time and their sticks did not allow deflections." Coach Terry Murry was complementary of Bernier, "He had a pretty big game here today. This is a building where we haven't had much success. You see his composure in net. The season he has played in the minors has done good things for him. He's showing signs of becoming a really good goaltender at this level." The Predators continue to struggle, giving up a pair of critical goals in the third period, in three of the last four games. Monday night, the Preds fell behind Florida when they gave up two goals in the third before coming back to tie and win in overtime. Last Tuesday, against the Stars, the Preds gave up two goals in the third to lose 3-1. A similar scenario happened on Thursday against the Coyotes when the Preds gave up two goals late in the third and were forced to overtime before eventually winning in a shootout. "I don't think our energy was where it needed to be tonight, mentally or physically," stated Dan Hamhuis. "Mentally, we didn't have the urgency. It has been a long month and the schedule lightens up here in the next week so we can re-energize." Tuesday's game was the second straight game where the Preds were shutout at home. Last Saturday against the Wings, neither team dampened the net until the shootout. Barry Trotz commented, "We weren't sharp in the first period, but in the second and third, we shot hard but couldn't get one by them and they capitalized on their chances. This time of year, it's been tough to score. The last seven games have been 0-0 or 1-1 for most of it and there's not much going on in terms of offense." "It's been tough, I don't know what the reason is, " said Pekka Rinne. "Tonight their goalie played really well and I don't want to take too much away from him. It's all about execution, having guys screening and staying in front of the net. Maybe we need to improve that side of the game a little bit." The Predators will take Wednesday off before returning to the ice on Thursday at the Bridgestone Arena against the St. Louis Blues. After that, they will play in Detroit on Saturday, in Phoenix next Wednesday, and then return home on April 10 for the season finale against the Blues. The Nashville Predators have no time to celebrate their latest come from behind overtime win over the Panthers last night in Florida. They hit home ice tonight against the L A Kings at 7 p.m. at the Bridgestone Arena. Going into tonight's game, the Preds are in fifth place in the Western Conference with 94 points. They have a three point lead over Detroit, four points on the Kings, and a five point lead on Colorado. All three teams have played two less games than the Preds. Looking up in the standings, they have little chance of catching Phoenix who is in fourth and six points ahead of them. Pekka Rinne will return to the Pred's net after having last night off. Rookie Johnathan Bernier, who was an emergency recall yesterday, will start for the Kings. The Predators have three games in the next five nights and then only have two left next week. The teams that are chasing the Predators each have two extra games to accumulate points next week while the Preds are idle. Therefore, the Preds need to get all the points they can this week so they have a bit of a gap while the other teams are chasing them. Tonight's game can provide a four point swing with the struggling Kings and the Preds need to take advantage of that. It is the final time that the Preds play a team they is on their heels. It would be easy to take a shift or a period off tonight after having played last night on the road and 16 games in the last 28 days, but the Preds need to give a full 60 minute effort. They will have extra time next week when other teams are playing and the week after that while waiting for the playoffs to get the extra rest that they need. The Predators have beaten the Kings seven straight times including all three games this season. The Kings are also riding a four game losing streak after their loss last night in Minnesota. Neither of these streaks mean anything and tonight's game is a clean slate that will stand on its own the minute the puck is dropped. The Kings are desperate for points as they want fifth place as much as the Predators. They will turn it around at some point, and the Preds need to make sure it isn't tonight. The other side of the King's story comes from the L A Times, Kingscast, Press Telegram, and the Kings Insider with Rich Hammond. Here is out game recap from last night as well as a humorous piece on the Top Eleven Tweets after David Legwand scored his eleventh goal. John Glennon has his game story, notes column, and postgame ponderings from last night. In Pred Blog World reports come from Section 303, Forechecker, The View from 111, Fan Huddle, and See Puck City. The other side of the game story can be found at the Miami Herald and the Sun Sentinel. Here is the Tennessean's Game at a Glance for tonight's Preds-Kings game. Jim Diamond has the story of Yanik Perreault being inducted into the Quebec Major Junior League Hall of Fame. The NHLPA has a feature story on Patric Hornqvist. The Hockey News must be trying to make up for last week's hack job by Ken Campbell with some kind words in this week's power rankings. Open Ice Hockey has some alternative NHL Awards and the Pred's Ice Girls get the nod in one category. The Phoenix Business Journal and SB Nation have a story about a possible Coyote move to Winnipeg. It's too bad folks can't sit on these stories until after the playoffs and let Phoenix fans enjoy the run. Here is Bill Daly's press release responding to the story. Travis Hair has a different explanation at Five for Howling. Eklund had a poll of over 1000 folk's second favorite teams. Preds at 12 is not bad for a non-traditional market. Who says "non-traditional" hockey markets can't produce excitement. Puck Daddy has the story and videos of one of the largest brawls of the year that occurred Saturday night in Knoxville. Expect more fireworks when Knoxville and Fayetteville meet in the first round of the SPHL playoffs this week. Central Scouting has released their latest lists of rankings of North American players by league/region. Here are some early mock drafts by several experts. Steve Lapore asks hockey folks not to ruin the projected Winter Classic matchup by complaining. Steve has a good argument for folks to leave the bashing aside at this point. Chuck Fletcher is launching an investigation in order to avoid as many injuries on the Wild in the future. When Marian Gaborik was playing well and the Rangers were in contention for a playoff spot, everyone assumed it was a mater of time before the meltdown occurred. Larry Brooks has the story of Gaborik's most recent failings. Five Reasons B D Gallof Loves Hockey. DirecTV has jumped on the ESPN 3D bandwagon. Adrian Dater questions the heart of the Avs in their loss to San Jose's "B-Team". Amanda Fortier takes a look at Calder Trophy candidates at View From My Seats. Travis Hair has started an adoption campaign seeking support from non playoff teams. Could the Yotes be designated "America's Team" since they fought off Canadian imperialism? Web site TripAdvisor.com has seen an increase in hits from a fake destination called Schrute which comes from Dwight Schrute's fictitious Bed and Breakfast on an episode in 2007. Instead of deleting the site, they have embraced the publicity. Smart move. Good advice from our friend George Scoville on phishing scams as the tax deadline draws near. Too many foreign language tweets? This may help. What happens when flashmobs go bad? Here is the Philadelphia story. The Nashville Predators came from behind to beat the Florida Panthers 3-2 in overtime at the Bank Atlantic Center on Monday night. It was only the Pred's second win at the BAC, with the other coming in December 2002. Francis Bouillon "Cube" scored a goal exactly one minute into overtime to win the game for the Predators. Bouillon had never scored a game winner in overtime and more than made up for his inability to tie last Saturday's game in the eleventh round of the shoot out against Detroit. The Predators went ahead at 2:41 in the second period on a goal by David Legwand that broke his scoreless drought that dates back to January 2, when he scored against the Ducks. The 1-0 Predator lead held until early in the third period when Florida came back with goals by Keith Ballard and Stephen Weiss 2:41 apart to give the Panthers a 2-1 lead. The Panthers seemed to have the upper hand until Patric Hornqvist scored with 3:12 seconds left to send the game into overtime tied 2-2. With the goal, Hornquist became the fourth Predator to score 30 goals in a season, joining Steve Sullivan, Paul Kariya and Steve Sullivan. He is now three away from the Pred's single season record of 33 that was set by Jason Arnott last season. Dan Ellis, playing what may be his final game as a Predator, stopped 27 of 29 Panther shots for his 15th win of the season. Scott Clemmensen took the loss as he allowed three goals on 25 Predator shots. For the third game in a row and for the fifth time in the last eight games, the Predators could not settle the matter in sixty minutes of regulation play. After Saturday's game, Pekka Rinne said the team has come to expect extra play. "I expect that usually when this team wins games it's by one goal, so you expect some games going to overtime or shootout. It's no big deal. I'm still confident we can win if it's overtime or shoot out." It is that kind of confidence in close, pressure-filled games, that will make this team different than prior Preds playoff teams once the post-season begins. In Barry Trotz's true "Band of Brothers" fashion, others stepped up when the Preds were without Captain Jason Arnott, Marty Erat, Joel Ward and Denis Grebeshkov. David Legwand scored his first goal in almost three months and Farancis Bouillon scored only his third goal of the year. Others have moved into new line combinations and played rolls different than they are used to, playing more minutes that they have in the past. Wade Belak even dressed for the first time in six weeks and managed to scrap with Steve MacIntyre. When you can win with a mix and match line up on the road in a come from behind game, it gives you things to build on as the playoffs loom near. Pekka Rinne had played nine straight games going into the game with Florida and, barring injury, appears will play the remaining games on the Predators schedule as they have no back to backs and position in the standings will be on the line through the final game. That being said, Monday's game may have been Dan Ellis' swan song with the Preds, and if it is, it's great to see him going out with a big win in a meaningful game. He has given 110% every time he has taken the ice and has no complained regardless of the role he has been given. Ellis has been a true Nashville Predator in his 111 games with the team. His 50-42-8 record with 10 shut outs ranks him as one of the all-time best in goal for the Preds. His .924 save percentage led the league in his first season with the Preds in 2007-08. It is a shame that economics dictate that he will move on to another team this Summer. Pred fans will always have fond memories of Dan and wish him the best wherever he lands. The Predators return home on Tuesday night for an important match with the L. A. Kings who are four points behind the Preds. The game could provide a four point swing and is critical as the Preds try to maintain their fifth place slot in the Western Conference and shoot of a 100 point season. So what do you do when you are 850 miles from where your team is playing and there is no video coverage due to an archaic blackout rule? You celebrate David Legwand's first goal in almost three months trusting that it really did happen despite a lack of video proof. And... You steal funny comments from others on Twitter and post them on your blog as a Top 11 List (since Leggy is # 11). 11 - @reagmeister: no more dry spell for leggy!!!!! wahoo!!!!! 10 - @Crackerjen: Go Leggy! WOO HOO! The drought is over! 8 - @stackiii: And with that, David Legwand resets @cellblock303's scoreless streak counter! 1-0 #Preds early in the 2nd! 7 - @mikebarnes5: HOLY s**t!!!!! 5 - @cellblock303: UPDATE: The Legwand-O-Meter stops at 85:21:13:51!! 4 - @jasonbohn9: david legwand? when did he start playing for the predators? 3 - @brandon_felder: I sense a disturbance in the Force... Did Legwand score somewhere? (Just kidding folks). 2 - @Forechecker: It figures David Legwand scores for the 1st time in months, and there's no video proof! 1 - @whatthepuck: If David Legwand scores a goal but no one was around to see it, did it really happen? The Phoenix Business Journal published a story today that said that the NHL had a back-up plan in place to move the Coyotes to Winnipeg. The story said, "Two sources with knowledge of the Coyotes finances and ownership said a deal between Thomson and the NHL has been completed in principle and could have the Coyotes back in Winnipeg next season if necessary." "In response to the many inquiries we have received in light of the story in the Phoenix Business Journal this morning, we would like to make clear that at this point in time the National Hockey League has no "deal" in place to move the Coyotes' franchise to Winnipeg -- or to any other city for that matter -- in the event a transaction cannot be timely consummated in Glendale. Our focus continues to be on completing a transaction with local ownership that is committed to operating the team in Glendale. Based on the communications and information we are receiving on a regular basis, the stakeholders involved continue to express a high level of confidence that that can be successfully achieved. We will not focus on completing arrangements for one or more alternative option(s) until such time as it may become necessary. "With respect to Winnipeg and Messrs. Chipman and Thomson, we have had ongoing discussions over time regarding their potential interest in owning an NHL franchise (as we have had with a number of other individuals and cities around North America) and potentially bringing an NHL franchise back to Winnipeg. It remains an intriguing possibility and one we would consider given appropriate circumstances, but there is nothing new to report on that front at this time." 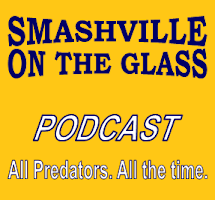 Programming Note: There will not be a POTG Radio show tonight due to the conflict with the Predators game with the Panthers that begins at 6:30. The game is not available on television anywhere. Predators radio appears to be the only option tonight. The Predators head to Florida tonight for their last game against the Eastern Conference this season. The Preds are 11-4-2 against Eastern opponents this year and the Western conference was 151-85-28 against the East through Saturday's games. Over the years, many folks have felt that the Predators should play in the Southeast Division in a grouping with Carolina, Atlanta and the two Florida teams to enhance natural geographic rivalries that have thrived in other sports. Just for fun, let's look at simple math and extrapolate the Pred's record against the East and West to see how they may have fared playing in the Eastern Conference this season. The Preds have played 59 games versus Western teams and have averaged 1.15 points per game. In 17 games versus the East the Preds have gained 1.41 points per contest. Reversing the number of games against the East and the West and applying the corresponding points per game numbers would give the Predators 102.74 points for the season, eleven more than they currently have. That would give the Predators the second best point total in the NHL, behind the Capitals with 109 points and clearly make them a favorite to go deep in the Eastern Conference playoffs. Will the Predators move to the East? It would be highly unlikely in the near future. However, in the long term, anything is possible. By that time, the balance of power could have shifted the other direction. Today, the Preds need to focus on playing a full sixty minutes against the Panthers and not let this become a "trap game" against a weak team that has distracted them on several occasions previously this season. The Predators can't afford to let up as a loss could cause them to fall from fifth to seventh. Dan Ellis will start in goal for the Predators in what may be his last start wearing the Pred's colors. Barring injury, Pekka Rinne should start the remaining games. The other side of the story of tonight's game can be found at the Miami Herald and the Sun Sentinel. Here is our postgame story with interviews from Saturday. John Glennon has the game story, notes and postgame ponderings from the game. David Boclair has the story for the City Paper. Puck Daddy has a video of the low point in the Preds-Wings shoot out when Patrick Eaves fell down. The Red Wing story comes from MLive.com, the Detroit Free Press, and The Detroit News. Pred's prospect Blake Geoffrion had a great opening weekend in the NCAA sweet sixteen as Wisconsin advanced to the Frozen Four next weekend. As he competes for the Hobey Baker Award, he was named the Regional MVP. John Glennon has a few thoughts about Geoffrion heading to the final weekend. Here's the story on Friday's win over Vermont. Here's a link to Madison.com, the hometown paper for the Wisconsin Badgers. The Badger Herald is on Spring break this week but has the Saturday night story. Puck Daddy has the wrapup of Sunday's two games including Miami's double overtime win last night. I met the visiting Sheri Magrini who runs the PekkaRinne.com web site on Saturday. She was in town for the Coyotes and Wings games and was really enjoying her visit. Be watching over the next few days a she will provide updates from her trip. John Glennon discusses more one goal games and Dan Ellis' return in goal. He also has the game at a glance. Jim Diamond has his weekly prospect report including some playoff schedules for the Windsor Spitfires. David Boclair discusses the need for a cure for the Pred's third period blues. Section 303 has a Preds-Panther's preview. AJ has a really good perspective piece on Jason Arnott and his concussion history. Mark Willoughby has been working on nominations for the "Hattie" Award and I think all can agree that The Hockey News' Ken Campbell is a great first winner. Section 303 has a new 303:30 with Brandon Felder and Ken Kal. The Admirals were swept in the home and home series against Grand Rapids. Short Shifts has the story. Patric Hornqvist is featured in a story at NHL.com. Jim Diamond has some interesting information from Paul Fenton about some potential collegiate signings. Dirk has a good article about Jon Blum with an assist from Short Shifts. He also has the story of the ruckus over Tennessee's privilege tax. Bridgestone obtained their domain name, Bridgestonearena.com according to a Nashville Post story. The usually reliable Chris Botta has jumped on the bandwagon of folks stating that next year's winter classic will be at Heinz field and feature Pittsburgh and Washington. From @DamoSpin: Players rip Bettman #NHL for years for knowing nothing about hockey. And Donald Fehr is somehow different? This is definitely a point worth pondering. If Fehr takes over the NHLPA, the chance of another lock out goes up substantially. Puck Daddy has a discussion and a poll about who should win the Hart Trophy? Thankfully, it's not an automatic for Ovechkin this year. NHL.com now has a "destination playoffs" page with ongoing updates of who is in. Down Goes Brown and Blogesalming team up on a video introducing Canada's teams to the US audience for NBC. Good to see that Travis Hair at Five for Howling is back with a new episode of Barking at the Moon podcast on BTR. Mike Chen has some good news on attendance trends at the Coyotes' games. It has been delayed over twenty years but the "greatest game never played" will finally happen next Saturday with players from all over the country competing. Here's a video from NHL.com explaining legal versus illegal hits to the head. Congratulations to Bruce Perle and the Tennessee Vols who made it to the elite eight for the first time before losing in the final second to Michigan State on Sunday. I don't advertise it often, but I am a Volunteer alumni. Too many criminals on the football team during the Phil Fulmer era drove me away from being a Vol fan. I have payed slightly more attention with the current regime that appears to want to decriminalize the program. The Tennessean has a photo gallery of the top 25 things to see in Nashville. This would be a good guide for visiting relatives that want to go sightseeing (other than country music stars homes). I don't get out much as I've only been to 13 of the 25. Amy Dawson has a post showing you what a visiting movie star likes about Nashville. We here much about pollution on earth but the Europeans have designed a min-satellite to clean up all the space junk that is clogging up outer space. The Nashville Predators and Detroit Red Wings battled for 65 minutes with neither team able to score a goal before the Wings reigned 1-0 after an eleven round shoot out. Niklas Kronwall put the puck past Pekka Rinne in the eleventh round to seal the victory for the Wings. It was Kronwall's first ever shootout attempt. The game was all about goaltending and defense. Jimmy Howard stopped all 33 Predator shots and Pekka Rinne stopped the 38 shots that the Wings threw at him as each recorded a shut out. A new Predator record was set when the shoot out went past the ten rounder that the Preds had with Phoenix on February second which was also a double shut out. "It was a good game", said Barry Trotz. "Both teams didn't give an inch and we saw it go eleven shooters deep and it was a great goaltending performance by both those guys. Unfortunately they snuck one by us." On how he plans for a long shootout Trotz explained, "We talk with Mitch Korn who looks at the other goaltenders, and the style and tendencies, and usually before the game we go five guys deep and then go from there." "It was a good game for both sides." Trotz said. "It was going to be tough to have a loser in that game. You go eleven rounds deep in the shootout, that's good goaltending. That's the way it is." On going eleven deep in a shootout, Pekka Rinne said,"At that point, it is like flipping a coin. It's always going to end up like that and someone squeaks one by you. Obviously, I was mad right afterward, but it was a solid effort and we picked up one point. I'm sure this will turn out to be a big point." The Predator's defense played one of their best games of the year. There were minimal second chance goals on rebounds as the team swarmed the slot and cleared pucks consistently. "There wasn't many second chance shots," Explained Trotz, " That is what Detroit is really good at, keeping pucks alive in the slot, and breaking you down defensibly by throwing pucks there and crashing the net and we did a pretty good job." Trotz continued, "We tried to take a little bit of their game away from them and I think we did a pretty good job in some areas.."
Pekka Rinne was also pleased with the Defense, "The guys played so well. Tonight, we had a lot of blocked shots. Even forwards diving in front of the puck and sacrificing their bodies. That was a good team effort." The point gained by the Predators kept them in fifth place at 92 points. The Wings are a point behind and have played one less game. Los Angeles and Colorado both lost on Saturday and are two and three points back respectively, and each have two games in hand. Calgary suffered the biggest blow of the day to their playoff hopes, losing 5-0 in Boston. They are now six points out of eighth place with seven games to play and face the Washington Capitals on Sunday afternoon. The Predators leave on Sunday foe South Florida and a Monday night match with the Florida Panthers. They return to the Bridgestone Center on Tuesday to play the Los Angeles Kings. The Nashville Predators moved closer to a playoff berth last night with their 4-3 overtime win over Phoenix. Before the game started, I said that it would be great if the Preds won in overtime so that the Coyotes would still get a point. It was the first time in history that I actually wanted to see a three point game because we have been pulling for the Yotes to do well. When the Preds were up 3-1 well into the third, I never imagined that overtime was a possibility, but you never know. With the win and the Calgary loss to the Islanders, the Preds are back up to a 99% chance of a playoff position. Barry Trotz repeated his prediction that it will take 97 points to make the playoffs. Calgary would have to go 7-1 to get to that level so Barry may be shooting high since that seems unlikely. Saturday's game with the Red Wings will be another big test for the Predators as it will directly affect the standings with a possible four point swing if it ends in regulation. The Preds went into Detroit three weeks ago and failed miserably with a weak effort. Hopefully, we will see a better effort at home tomorrow night. We'd like to give a special thanks to Mark Willoughby for inviting us down to his palatial lower bowl seats for last night's game. It was good to see the game from a different angle and enjoy the company of Mark and his lovely wife. Here is our story and interviews from last night. John Glennon has the game story, notes column and postgame ponderings. Jim Diamond has his game story at the Examiner. David Boclair reports from the City Paper. In the blogs there are posts from Forechecker, Brandon Felder, View from 111, and See Puck City. The other side of the story comes from the Arizona Republic, Five for Howling, the Phoenix Examiner and The Coyotes Aggregator. Three Predator prospects received high honors from the OHL for their play this season. David Poile gave high praise to the Coyotes yesterday at Inside Predators. The Admirals got beat by the last place Grand Rapids Griffins 3-2 last night. Mark Willoughby has his weekly View column. After all the posturing, the "head shot" rule was approved yesterday by the NHLPA and was in effect for last night's games. A shocker last night was the Blue Jacket's 8-3 blow out of the Blackhawks. Even more shocking was how Joel Quenneville handled Christobal Huet. The Hockey Writeres have the story. For updates on the NCAA Hockey Tournament this weekend, Inside College Hockey has wall to wall coverage. Hockey's Future finishes their top 50 prospect list with the top 10. They also have their results on their poll of who will win the Calder Trophy. Finally,they have a preview of prospects playing in the NCAA tournament. Matt Reitz has an interesting view of different fan perspectives. Puck the Media has a guest post with a review of the NHL 3D game in New York. Here's another side of the story from Intent to Blow. From @BenThrashers: Wayne Gretzky radio interview on CBC... from 1974. He was 13. I have really enjoyed the BBGeeks web page for teaching me what I wiould know if I read my instruction book. Adding a participant to a phone call is really easy. The Nashville Predators gave up two goals in the third period, allowing the Phoenix Coyotes to tie the game, but rallied in the shoot out to come away with a 4-3 win. David Legwand scored the shoot out winner on Ilya Bryzgalov to seal the win for the Predators who have won seven of their last eight contests. Phoenix has now lost two in a row after a nine game win streak. Phoenix took an early 1-0 lead in the game when Lee Stepniak scored early in the first period. Nashville came back with three unanswered goals from Patric Hornqvist, Steve Sullivan and Dan Hamhuis to take a 3-1 lead into the final period. Phoenix came back with two quick goals by Wojtek Wolski and Keith Yandle in the third period to force the game into overtime. Both teams skated well in the extra period but neither could close the deal. In the shoot out, Lee Stempniak and Cal O'Reilly traded first round goals before David Legwand had the winner in the third round. Adrian Aucoin had never missed a shootout goal, after going five for five recently, but was stopped by Pekka Rinne in the second round. Pekka Rinne got the victory stopping 32 of 35 Coyote shots while Ilya Bryzgalov stopped 28 of 31 Predator shots. Phoenix has been a league best 12-5 in the shoot out this year and had phenomenal success in all games that went past 60 minutes with a 17-6 record. The Predators were fortunate to win against such imposing odds. Barry Trotz found positives in coming back with a win in the shoot out after giving up a two goal lead. "These guys are excellent in the shoot out and overtime and have a lot of wins and a lot of points in the extra session. That's what I'm focusing on is that we found a way to win and that is real important." Trotz also explained his choice of David Legwand as the final shooter, "If you look at a lot of our shoot outs, Leggy's been the clutch guy. He a guy that came through when we were down or when we needed a goal. He's been real clutch, and we felt he would be clutch again, and he was." Patrick Hornqvist discussed having to go to overtime, and summed up the thoughts of the whole team, "When you are in the car on the way home you have two points and that's all that matters." After a somewhat lackadaisical outing on Tuesday, that cost them two points, the Predators played with more jump and energy from the start of the game. It is hard to comprehend why one game can be so different from another. "That's the game of hockey, some nights you got it and some nights it's harder to get," explained Steve Sullivan. "In 82 games in a season, you are not going to be at your best. Our job as professionals is to make sure you minimize mistakes when you are not at your best and try not to hurt your hockey club and when you do have it, you try to make the most of your opportunities." For the second game in a row, the Predators gave up two third period goals at an inopportune time. Fortunately, they were able to recover in the shoot out to salvage the much needed two points. Steve Sullivan discussed the third period, "I think it was a little bit of us. I think we were on our heels trying to protect our lead instead of keep going at it." Barry Trotz took a lighter approach, "It's the Predator way. It's always exciting and you get your bang for the buck, keeping you here right to the end. No one can leave early." Trotz then turned more serious stating, "We could have managed the puck a little bit better but I look at it that they are one of the best third period teams in the league. They just come at you with a lot of depth. They activated their D. We didn't manage the puck as well as we wanted but the real positive is that they are something like 34-3-3 when they score the first goal." Every night the Western Conference teams seem to go up and down in the standings. The Predators moved from seventh to fifth with the win on Thursday night. They finished the evening with 91 points which is a point ahead of Los Angeles, two points ahead of Colorado, and four points ahead of Detroit. Each of those three teams have played two less games and have additional opportunity to gain points. Calgary, who is in ninth place with 83 points lost to the New York Islanders to give the Predators an eight point cushion in the race for a guaranteed playoff position. Calgary has eight games remaining and the Predators have seven. The Predators return to the ice at the Bridgestone Arena on Saturday night to face the Detroit Red Wings in an important game as both teams are battling for playoff position. Tonight's Nashville Predator and Phoenix Coyote match promises to be a sixty minute battle for positioning in the NHL Western Conference. The Predators fell to seventh place on Wednesday when Colorado beat Los Angeles in a shootout. The Preds have 89 points but have played one less game than the sixth place Avs who also at at 89. The Preds are also a point behind the fifth place Kings and two points in front of Detroit, who the Preds play Saturday. The Coyotes are in fourth place, one point behind second, and the Pacific Division leading San Jose Sharks. They have a seven point cushion over fifth place so it appears that the top four are set and it will be a battle for position from here on out. The Predators will be without Joel Ward tonight and the word on Jason Arnott does not sound promising. The Preds ended their six game win streak on Tuesday and Phoenix's nine game streak was also stopped by Chicago. One team will win, and plant a seed for a new streak and the other will leave in the midst of a two game late season slide. After a poor effort on Tuesday night, it is time for the Preds to turn up the heat and play like they were playing before that game. They don't need to worry about who is out, but need to find a way to win with those is on the ice. I wish Barry Trotz would replay the player's post game interviews to the team right before they hit the ice tonight to remind them of what they don't want to be saying about 9:30 after the game. To a man, each player was disappointed with the effort. Instead of being disappointed, they need to give all they have for the full sixty minutes and let the hockey gods sort it out. The other side of the story comes from the Arizona Republic and Five for Howling. Bryan Mullen compares the Preds and Coyotes and says Arnott is day to day in the notes column. There is also the game at a glance. David Boclair talks about the Predator's short memory at the City Paper. Mark Willoughby takes on The Hockey News over Ken Campbell's wreckless reporting. This is one of Mark's best. Mark also previews the Pred's Wine Tasting Benefit set for next Wednesday. Barry Trotz speaks to Slam Sports on the head shot rule and wants the NHLPA to cut out the posturing and get something done now. Puck Daddy has Joined up with Golden Puck/Northland in the NCAA Hockey Bracket Contest. Locally, Section 303 has a group for friends and Nashvillians. The Group name is Cellblock 303 and the password is their favorite taunt yousuck. All are invited to join the group. Patric Hornqvist gets some props in Ryan Porth's top five breakout players of the year. Chris Burton speculates on a rumor that the Predator's third jerseys may become their home jersey next season with a new design for the road jerseys too. Several other teams are changing things up too. Chris also has the game day preview. Paul McCann has a nice piece about University of Alabama-Huntsville and their NCAA tourney appearance. Mike Heika writes good things about the Preds at Versus. Darren Dreger has the story of the NHL considering bypassing the NHLPA on their new blindside rule. Without a true leader in place, the NHLPA has left itself open for the league to attempt to circumvent the players. The NHLPA really needs to get on the stick and get someone in charge.The tide could turn if they hire Donald Fehr. The NHL Lock Out Hat Trick, Intent to Blow has the formula. Bill Daly was on XM 204 on Wednesday discussing the proposed head shot rule and the stance by the NHLPA. Forechecker has a frame by frame look at the Volchenkov hit on Simone Gagne from Tuesday with a poll as to whether it was a dirty hit or not. Brian Metzer has a story of the Penguins releasing a free application for Android phones that Pens fans will enjoy. From @NHL: Like classic @NHL games? 2day we launched NHL Vault w/growing list of 150+ games dating back to the 60s. Available w/NHL GameCenter Live. Also from @NHLschuylerb 3/22 Pitt/Det is VERSUS' highest-rated,most watched reg-season game ever,most watched NHL reg-season cable game since '04. 2004 eh? Now what cable network was that on? Things looked good with the NBC playoff schedule in their initial listings, but now they are skipping the second weekend in May for golf. The Hockey Zen continues with their fan series with Everett Duke form Atlanta. Can computers blog better than hacks like us? Read this to see if that is the future of blogging. With Easter just around the corner, here comes a new study of "Last Supper" artwork that indicates portions sizes have increased over the last 1000 years. This is really odd. Go to this page and you can see the salary of any Tennessee state employee by putting their name in the blank. Seems like this is some tpoe of privacy violation. Also in Tennessee, some of you out of staters may find this odd but Tennessee again failed to pass an open container law for passengers in a vehicle. As long as the driver is sober, other folks in the car can get as toasted as they want to be. Historically, this has never passed because too many lawmakers like to party on the way to University of Tennessee football games where they get free tickets. The Nashville Predators signed collegiate prospect Ryan Thang to a two year, two way contract. He will play in Milwaukee for the rest of this season. Nashville, Tenn. (March 24, 2010) – Nashville Predators President of Hockey Operations/General Manager David Poile announced today that the club has signed forward Ryan Thang to a two-year, two-way contract worth $525,000 per season on the NHL level and $55,000 per season on the American Hockey League level. Thang, 22 (5/11/87), recently completed his four-year collegiate career at the University of Notre Dame, ranking second on the team in both points (23) – for the third time in four seasons – and goals (9), while serving as captain in his senior season. As a sophomore in 2007-08, the Edina, Minn., native helped the Fighting Irish become the lowest-seeded team in tournament history to reach the NCAA National Championship Game, pacing them in goals (18) and game-winning goals (5), while ranking second in points (32). The 5-11, 189 pounder also led the Irish in goals (20) as a freshman in 2006-07. Nashville’s fourth choice, 81st overall (third round) in the 2007 Entry Draft, Thang amassed 115 points (57g-58a) in 159 NCAA games. He will report to the American Hockey League’s Milwaukee Admirals for the remainder of the 2009-10 season. Another day and another look at Sports Club Stats to try to make sense of the Western Conference Playoff Race. The Pred's chances for the playoffs fell a bit to 95.6% with a best guess of 4-3-1 for the rest of the season which would give them 98 points and a 99.9% chance of the playoffs. SCS has the Preds pegged for seventh at this point. Last night's game against the Stars was a real groaner. The Predators toyed with the crowd by keeping it tied until the start of the third period but you could not help but having a nagging feeling that something was wrong and it was just a matter of time before the other shoe fell, and it did. The line combinations that looked like world beaters last week were in shambles last night with the absence of Jason Arnott and Joel Ward. It is amazing how winning six games in a row can seem like such a distant memory after you witness a thirty second meltdown that led to a 3-1 loss. Every Predator that we spoke with after the game was ready to put the game behind them and move on to the next one. Ryan Suter was particularly frustrated and stopped short of going on a rant of his feelings playing against Dallas's trap defense. His blunder at the blue line led to the Star's second goal that basically defined the loss. Hopefully, this game will act as a wake up call just as the Preds 8-5 loss to San Jose did before the six game winning streak. It would certainly help if Jason Arnott can be ready to play on Thursday night. As Barry Trotz said at the end of his presser last night, "The most important game of the year is Thursday night against the Coyotes." Jim Diamond has his story at the Examiner. David Boclair reports in from the City Paper. In the blogs there are posts from Forechecker, Brandon Felder, Section 303, View from 111, AJ, and See Puck City. The other side of the story can be found at The Dallas Star Telegram and the Dallas Morning News. Ken Campbell’s article yesterday (Monday) is a piece of crap intended to preach to the Canadian choir and inflame the Make It Seven crowd. Unfortunately, at the most inappropriate time during the playoff run, some local TV station or hack journalist will point to it as a reason to distract potential fans from enjoying the playoff push. I really think some in the local media set a diary as a reminder to stir the “Preds are leaving town” story on a regular basis. Nate Rau at the Tennesseean also writes about the Preds making the attendance goal. A new poll at On The Forecheck as to whether Kevin Klein should be scratched when Grebeshkov returns. I have been told that Pekka Rinne will be Wade Belak's guest at Blackstone tonight. PekkaRinne.com creator Sheri Magrini will also be in the house so if you see her, give her a big Nashville welcome. Crash the Crease has an interview with Pekka Rinne from Curtis Tudor. Lance Wilkerson, who is the Sports Director at WEHT in Evansville, came down for last Saturday's game against Columbus and shared a photo essay with us. Yes, that is Section 303's Codey Holland in a few of them. It's always fun to see an out of towner's view od Smashville. Preds.com has the story of Ravenwood High School winning this year's Predators Cup. The Milwaukee Admirals did better than the Preds on Tuesday as the beat the other Stars (Texas) 3-2. I appeared as a guest host on Ryan Porth's RLD Radio yesterday with The Hockey Guy's Anthony Curatolo and guests Bill Kellett, a Western Canada scout, and Joe Gladziszewski of InsideCollegeHockey.com. It was a good show with plenty of prospect and college hockey discussions. Big controversy developing after last night's decision by the NHL Board of Governors to try to implement a "head shot" rule immediately that involves only supplemental discipline. The NHLPA is not happy that the sequence that is laid out by the CBA wasn't followed. Paul Kukla looks at the video of Anton Volchenkov's hit on Dan Carcillo last night. From what I understand this is still legal. A new steroid investigation involved a visit to the Washington Capitals training facility by police. No specific allegations have been made so it will be interesting to see what develops. Ryan Porth looks at how the schedule would have looked yesterday with a three point per game system. The Wings would be on the outside looking in at this point. The Penguins are giving away a cool metal commemorative ticket for the last regular season game at Mellon Arena. Brian Metzer has the story. Make sure and watch the video. It is really cool. Steve Mason had his boyhood dream fulfilled when he faced Marty Brodeur last night. If things weren't bad enough in Edmonton, they couldn't find anyone to ride the pine pony with goalie gear on last night. Here's a video of the bench clearing brawl from the Barrie Colts at Sudbury Wolves game on March 20, 2010. The "Big Middle" has disappeared in the consumer market. This is an interesting look at price and quality in the marketplace. A new study shows social networking at work boosts productivity. Who knew? Here's an academic look at Twitter and the influence of Social Media. 75-100 dead snakes in a house is not something you hear about every day. Steve Sullivan, Pekka Rinne, Shea Weber and Ryan Suter speak. The Dallas Stars went into Music City on Tuesday night and came a way with a 3-1 victory over the Nashville Predators that snapped the Pred's six game winning streak in a game that lacked the intensity or drama of recent contests. Going into the third period the game was tied 1-1 and Dallas jumped on the scoreboard with two quick goals 30 seconds apart, by Loui Eriksson and Matt Niskanen to take a 3-1 lead. From that point forward there was little pressure on either net for the remainder of the game. In the second period, Trevor Daley scored for Dallas at the 8:10 mark and Shea Weber matched the goal at 16:02 with one of his patented bombs from the point. In the third period the game appeared over before fans settled into their seats. At 1:30, Eriksson got past Ryan Suter and Shea Weber and slipped a shot past Pekka Rinne on a breakaway that ended up being the game winning goal. Ryan Suter was willing to take the blame, "I passed it right to their guy. It was a bad play on my part and it cost us." Thirty seconds later, on the following shift, Brenden Morrow fired a shot into traffic from the blue line that Niskanen tipped into the net to make it 3-1. Barry Trotz felt that was the turning point, "If it was a 2-1 game, I think maybe we tie it up. With the two goal lead, they were checking too well tonight." The Predators out shot the Stars 35-14 and had an astounding 70-32 margin in the Corsi numbers. Kari Lehtonen stopped all but one of the Predator shots for the win. Pekka Rinne only saw 14 shots from the Stars but let three find the net. Trevor Daley gave Lehtonen credit for the win, "Our goalie was unreal and that was a big part of our win tonight." While the Predators dominated on the score sheet they did not have the same level of intensity as they have had in recent games. "We definitely played with a lack of urgency," said Shea Weber. "We weren't really jumping the pucks and playing the way we are used to. We got a not of shots but none really of great quality." Steve Sullivan was in agreement, "We didn't play sharp. Maybe it was a lack of urgency on our part. We couldn't sustain pressure. I think that's what kills teams, when you can sustain pressure, you can't kill their will. We couldn't do that. We played soft hockey." Dallas's trap defense kept the Predators from putting as much pressure on the net as they would have wanted. After the Stars went up by two with 18 minutes left in the game, the Stars chose to play defense and only had one shot for the rest of the contest. Shea Weber discussed the Dallas system, "They are patient. They play a trap system and have the skill and transition to counter on turnovers and make you pay." "I don't think we had enough guys going to the really hard areas," explained Barry Trotz. We stayed a little bit to the perimeter and you can't do that, not with the way they are playing. You've got to go to the hard areas and win those puck battles." With the Predators, Coyotes, and Canucks losing, and Chicago, San Jose, and Calgary winning, the Western conference race became more jumbled. The Predators stayed in sixth place with 89 points, which is two points ahead of Colorado and four points in front of Detroit. Both the Wings and Avs have played two less games. Calgary picked up a bit of ground and is now six points behind the Preds with a game in hand. The Predators will continue their homestand on Thursday night against the Phoenix Coyotes who also saw their nine game streak come to an end with a 2-0 loss in Chicago. To a man, each Predator player pointed to the team's short memories of losses and were positive they would be ready for Thursday's game.